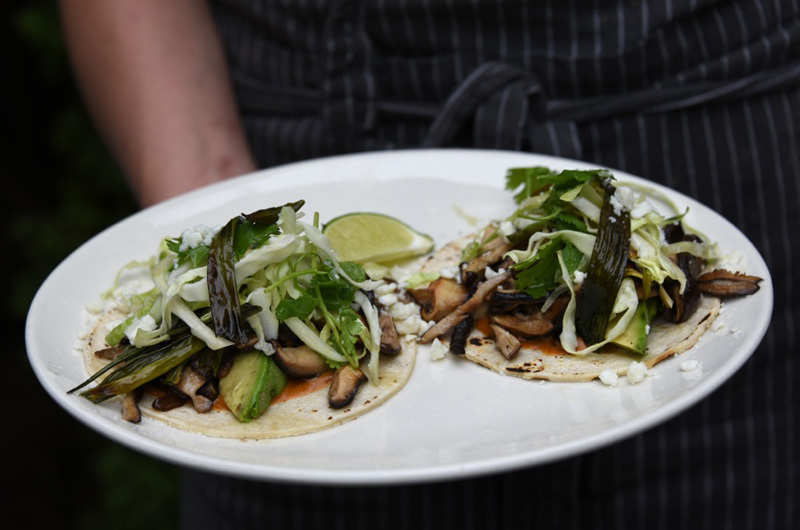 Chef Molly Levine uses mushrooms from MV Mycological for these delicious tacos, which also feature her chipotle sauce. She uses a mix of chipotle chiles in the sauce; the red Moritas are usually spicier than the brown chipotles, so if you can find only one kind, balance accordingly. You could also riff on these tacos with a store-bought sauce and a mix of your own favorite mushrooms. Wearing gloves, remove as much of the stem and seeds from the chiles as you can. Put the chiles in a heat-proof bowl and cover with 1 cup of boiling water. Cover and let stand for 15 minutes to hydrate. Put the chiles in a blender with the zest and juice of the orange, the honey, the roasted garlic, and the vinegar. Start the blender, adding just a little bit of water or cooking liquid if necessary to keep the chiles spinning. (If your orange was very juicy and your chipotles were very soft, you may not need the extra liquid.) Puree until smooth. Turn the blender back on and slowly pour the olive oil in a steady stream to emulsify the puree. Taste again if you like. At the restaurant we smoke the shiitakes first on a little homemade stove top smoker, however if you buy MVM shiitakes (they are leagues above any other shiitake), they taste amazing simply sautéed as well. De-stem, and slice the shiitakes, get a cast iron pan over a medium flame warming, add 2 tablespoons of olive oil and cover the pan with sliced shiitakes, let them simmer until golden and then stir and finish cooking for another few minutes, season to taste. We trim up the scallions, season with salt and olive oil and roast them at 400 degrees for about 10 minutes, until they are browned and a little crispy. You can also grill them. Slice the cabbage thinly, when it comes time to serve toss with fresh squeeze lime juice, a pinch of salt and good olive oil, massage the lime and olive oil into the cabbage to marinate, mix in freshly picked cilantro leaves and you have a perfectly summery fresh slaw for your tacos. Buy a good white corn tortilla, that is the key to starting off. Cronig’s carries La Tortilla factory which are my favorite store-bought soft corn tortillas. I like to touch mine on the grill before serving, or you can warm them in the oven or in a saute pan. Spoon some chipotle sauce onto the tortillas. Slice some avocado and season the avo with salt, spoon some sautéed shiitakes over that, top with slaw, roasted scallion, crumbled cotija and finish with a squeeze of lime. This recipe originally appeared with this article.